Renovation and Repair Loans: What Are Your Options for Home Remodeling? Real estate is valuable and tends to be a safe investment. Over time, the value of a home generally improves. For those who wish to remodel and renovate a home, it may be possible to use the value of the home to finance those updates. Refinance loans can help individuals to accomplish this in some situations. Property owners should consider all options carefully before moving forward. Before determining if it is possible to use the value of a home to pay for renovations on it, property owners should first focus on the value of the property. Lenders secure homes for new loans based on the current value of the home. This way, if the borrower fails to make payment on the loan, the lender can force the sale of it to recoup its investment. In short, it is not possible to get a loan for more than a home is worth. The value of a home is dependent on various factors. Real estate market changes are one area of consideration. The condition and features also play a role in its value. Generally, the lender defines the value of the home as the amount of money someone is willing to pay to purchase it. To determine this figure, the borrower will need an appraisal. How Much Can a Homeowner Borrow? For those considering a refinance home loan, the amount borrowed cannot be more than the current value of the home. Most borrowers will allow a property owner to take out as much as 90 percent of the value of the home. To determine this amount, the lender will require the borrower to obtain an appraisal. An individual comes to the home, inspects it, and assigns it a value based on the current market conditions in a specific area. From this, the lender can determine how much cash out the borrower can obtain. Here is an example. A home appraises for $250,000. The homeowner currently owes $180,000 on the home through an existing mortgage. This creates $70,000 worth of equity in the home. This is money not under a mortgage. 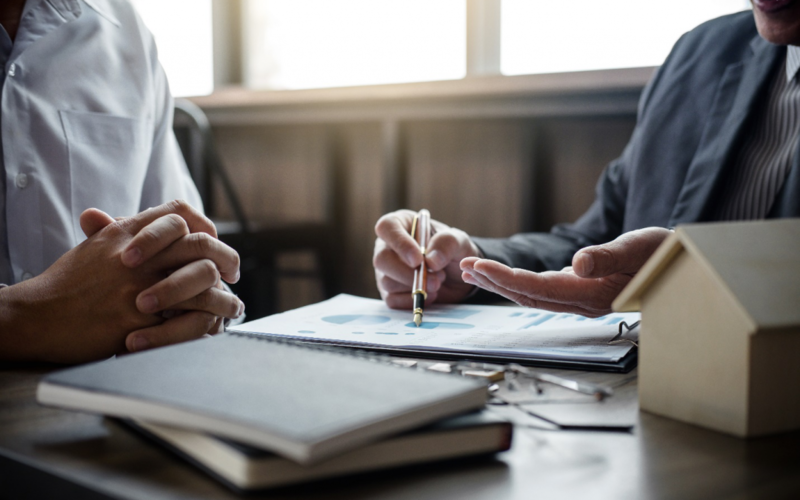 Depending on the lender’s specific rules, it may lend up to 90 percent of this value (lenders set the terms here based on the type of loan, risk factors, and lender rules). In this example, the borrower may be eligible to borrow as much as $45,000 on the home. (This includes the 10 percent equity that must remain). How Does Refinancing Mortgage Loan Work? Individuals who own a home and have been paying on it for some time are likely to have built-up equity. The money from refinancing can be used for any need necessary, including large remodels, home additions, renovations of other types, and even for other needs. But, there are other factors to consider before refinancing. Refinancing mortgage loan terms can be a good decision, but only if the home buyer benefits in some way through the process. For property owners considering a home mortgage refinance, there are several key things to compare carefully before making a decision. Interest is the cost of any loan. When obtaining a new refinanced loan, the property owner will likely have new terms, including a new rate. Refinance mortgage rates are close to current interest rates offered for new home loans. Each lender sets the right for its customers. It is important to realize the higher this rate is, the more the homeowner will pay to buy the home. Seeking out a lender with low refinance mortgage rates is always ideal. Several types of home refinance programs exist. These opportunities can accomplish a variety of goals for borrowers. Here is a look at some of the options potentially available. Making Home Affordable Program: This program aims to help individuals to refinance their existing loans into new loans with better terms. Generally, it allows for refinancing for homeowners who may be unable to qualify otherwise such as because the value of their home is higher than what they owe on it. Typically, this is not a true home refinance but rather a way of modifying loan terms with an existing lender. Home Affordable Refinance Program: Another of the home refinance programs available is HARP. It is ideal for some types of borrowers. Sometimes, underwater homes (those worth less than what is owed) can qualify for this loan. Qualifying for the program can be difficult because the homeowner’s current loan must be through Freddie Mac or Fannie Mae (the two government agencies for home lending). FHA Streamline Refinancing Program: Individuals who have a current FHA loan (one obtained with backing through the Federal Housing Administration) may qualify for this type of refinancing. The process is done alongside the current lender. The benefit of using this program is it is faster and can be ideal for those who have a simple process. Refinancing VA Loans: Individuals with a VA loan (one backed by the U.S. Department of Veterans Affairs) will benefit from refinancing through its Interest Rate Reduction Refinancing Loan Program. However, this may not be ideal for those who wish to get cash out for home remodeling. FHA 203K Loan: Some individuals may qualify for the FHA 203K Home Improve Refinancing Loan. It allows a person to take out up to $35,000 in cash from their home (depending on the amount of equity available) to use for home improvement projects. Individuals with an FHA loan may qualify, but homeowners that do not have an FHA loan may also qualify for it. Although these are some of the programs available, this is not the only option for most homeowners. It is possible to refinance home mortgage loans through brand new lenders, securing new loans, and not using any of these programs at all. Should a Property Owner Refinance? A home mortgage refinance can be a good thing for a property owner. This is very true for most renovations and remodels. There are a few key questions to ask before making this decision, though. Is the New Loan Worthwhile? A property owner who needs to make their home handicap accessible may benefit from a small cash-out refinance. An owner who wants to make a large update to their home, on the other hand, and does not have much equity may not benefit. To learn if a home mortgage refinance is ideal, the property owner needs to ensure there are enough available funds to handle the tasks available. This comes down to the amount of available equity in the home. Is the New Loan Affordable? What is the new length of time to paying off the home? Refinancing for 15 to 30 years is common. What is the new interest rate? Is it more or lower than the existing loan? A higher rate means the buyer will pay more for the home. What is the new monthly payment? It must be within an affordable range for the borrower to make easily. It is also important to factor in the cost of obtaining the new loan. Closing costs can account for as much as five percent of the new loan’s value. Sometimes, these must be paid upfront. Other times, the borrower can roll them into the loan itself. In all cases, it plays a role in just how affordable the new loan is. Does the Update Add Value to the Home? Another key reason to consider refinancing a home loan is that it can add value to the property. For example, adding a home addition or a new bedroom to the home can significantly boost the value of the home. If other factors make the new loan affordable, investing to add value to the home can be a good idea. All parties on the loan must agree to the new loan and refinancing. It is not necessary to remain with the same lender throughout this process. Borrowers can typically get more affordable rates by comparing lenders. Lenders can only gather basic information from this initial assessment. A true available funds amount is only available after an appraisal on the home. Not all lenders will qualify all borrowers. Individuals may wish to ask about credit qualifications before applying formally. A credit check is necessary for nearly any situation (though free information is available online). Discuss with the lender all available programs for refinancing. If a lending company does not offer a specific loan type or program, look for one that does. Consumers should shop for a home loan refinance offer that fits their needs. These are some key questions to ask any lender. Determine how much cash out is available based on the value of the home. A lender can provide some basic information right away. How Much Is Required Out of Pocket? Some loans have fees and closing costs the borrower must bring to the table when refinancing. Others do not require this. Most lenders require borrowers to pay for appraisals. Who Qualifies for the Refinanced Loan? Qualifications vary by lender. Most lenders will consider options if a borrower’s credit score is 620 or higher. Individuals will also need to have a steady income. Refinancing for cash out requires at least 10 (sometimes much more) equity in the home. The application process takes just a few minutes, but there are various steps in the approval process including underwriting. Most property owners can refinance under a few weeks. The lender can provide more information. Homeowners who wish to renovate, update, or transform their home should consider the value of refinance loans. This is a low-cost way of securing funds for renovations, especially when compared to high-interest rate credit cards. With numerous available home refinance programs, there are options available to keep costs down and to help those without a great deal of equity to secure help. Determine if cash is available, the interest rates available, and the end monthly payment to ensure these are affordable before obtaining the new loan. What Are Your Options for a VA Refinance Mortgage? Is an FHA Streamline Loan a Viable Choice for You? Programs available only to qualified borrowers. Programs subject to change without notice. All borrowers subject to underwriting and qualification. Some restrictions apply. Customers with questions regarding our loan officers and their licensing may visit the Nationwide Mortgage Licensing System & Directory for more information. Copyright ©2018 Landmark Mortgage Capital. All Rights Reserved.